Twitter is shaking things up with the recent announcement that they’re testing an increased character limit of 280. 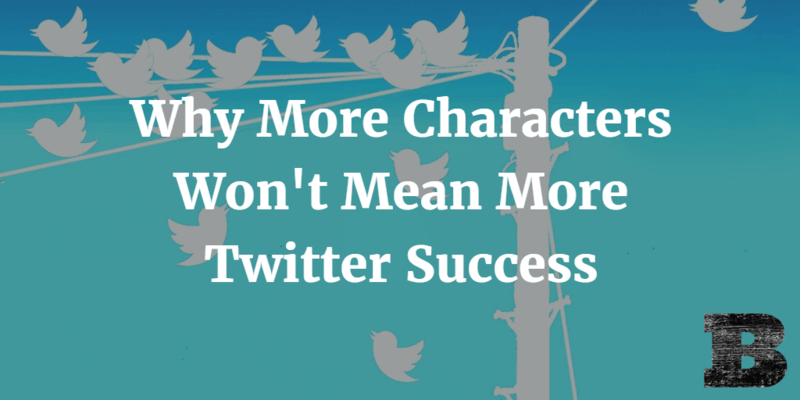 But do more characters mean a chance for increased marketing success? Most likely not. Here’s why. Many marketers are excited at the prospect of increased character counts. The assumption is that we’ll be able to convey more to our followers in each message. But according to the data, this just isn’t true. More characters don’t mean more engagements. In fact, the opposite is true. Shorter messages generally result in greater engagement and higher click-through rates across all social networks. Numerous studies have supported this result, including my own analytical data. In addition to causing decreased engagement, we need to consider the goal of our messaging. Looking to get people to click your link? More text is just keeping people from getting them to that point. You’re making the path to conversion longer and as we’ve seen from data presented by Amazon and others, a further distance leads to decreases in conversions. If you’re just looking to get your point across within the tweet, then additional characters may be beneficial. You’ll still want to consider if you really need those extra characters, or if a shorter message would make a more direct point. Just because we can share longer messages messages doesn’t automatically mean greater success from our social media programs. We must consider research based on hundreds of thousands of tweets showing short messaging is more engaging. Consideration of the intent of our messaging must be weighed also. We’re all excited to jump in and try changes as they come to social networks. But every change may not be as beneficial as we originally believe. Always weigh the available research and your own analytics to find what’s best for your success.